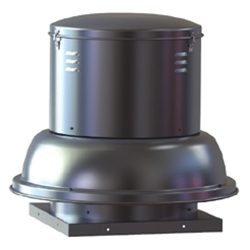 Model SDB belt drive units are used for the exhaust of relatively clean air from a wide range of commercial, industrial and institutional environments such as manufacturing and assembly plants, office buildings, schools, hospitals, restaurants, athletic facilities and many others. Power ratings (BHP) do not include transmission losses. Performance certified is for installation type A-free inlet, free outlet. Performance ratings include the effects of bird screen in the air stream. The sound ratings shown are the loudness values in the fan sones @ 5' (1.5m) in an hemispherical free field calculated per AMCA Standard 301. Installation Type A: free inlet hemispherical sone levels. *Tri-voltage (115-208-230) is standard on 3/4 through 1 1/2 Hp Single phase motors. Tri-voltage is available for the 1/2 Hp motors. Inquire for price and delivery. • 182T and larger motors shipped umounted for field installation.